You might recall, a few weeks ago, I posted about Lena White's OPI Sale. And well, me being me, couldn't resist ordering myself a couple of bits and bobs for myself and others. One of the products that I picked up in the sale was their Nice Stems Mini Collection, for the bargain price of £5.50, and after having a little play around, I created this Nail of the Day, which I really, really love. It's not that I dislike pink per se, but I tend to find that it doesn't really suit me or doesn't look right. 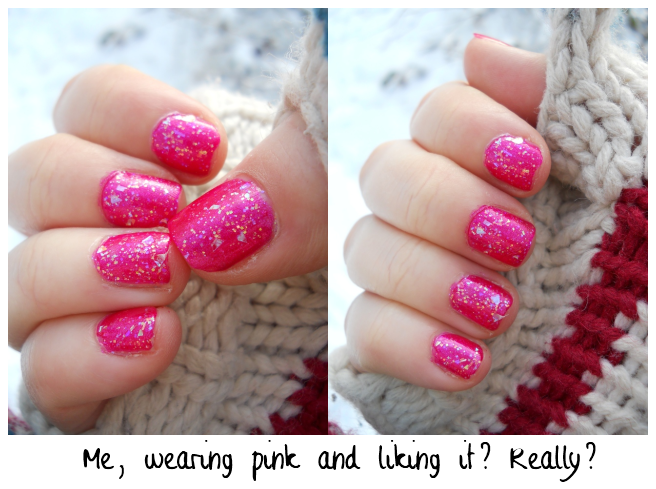 I have a bright pink, similar to this, by Rimmel that I just cannot get myself to like. And yet, I absolutely love this look more than words can express, and I've found myself looking at my nails....a lot! Sad, maybe. Be a Dahlia Won't You is an absolutely stunning rich pink (or Fuchsia!) colour, which a lovely shimmery effect. It looks gorgeous on it's own, and is definitely a "wow" kinda colour. It still amazes me how much I love this pink. It really is not my usual taste. I Lily Love You is a pink glittery shade, very similar to Excuse Moi, from the Muppets Collection which I reviewed a few weeks ago. 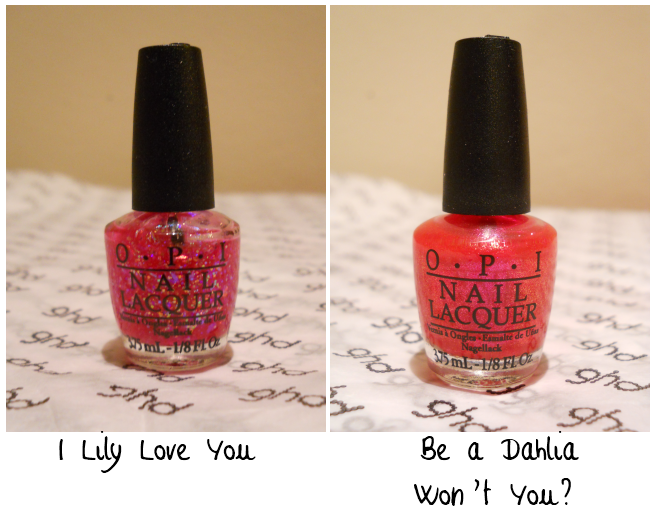 However, you might remember that on it's own, I didn't really feel that Excuse Moi looked that great, personally, but I Lily Love You is a really pretty colour alone, or as a top coat. What I love most about this polish is the fact that it's not quite like other glitter-based polishes. The sparkle comes in bigger sizes, that come across as foil. I don't know if it is foil, but the boyfriend described them as looking like mirrors, or a stain-glass window. The only problem with the larger glitters, is shown in the pictures of my nails, where you can see that the foil sometimes looks like tiny strips of sellotape that aren't stuck on properly, but I can assure you that they are. Despite loving the two polishes together, I did feel that the glittery bits dulled the base polish a little, so I perked it up a bit with a basic clear top coat that gave the polish it shine back. I picked these up in the Lena White sale last month, however, I checked and Collection is still available, for £11 each for the full-sized 15ml bottles, or £10.80 (reduced from £12.95) for the collection which includes both of these polishes, as well as Come to Poppy and Play the Peonies. What do you think to my pink sparklers? Did you hit the Lena White Sale? What did you get? Thank you :) I absolutely love it! Thank you :) I agree, it is pretty and very not what I'd normally go for!